Chequing Account Choices: Who offers the best chequing account solutions? It’s a jungle out there, especially in the banking world. Consumers have a wide range of choices when it comes to banking. Here is a primer to help you begin to sort through the options. This article focuses on major banks as well as some other options you may not have considered. Specifically, we looked at chequing accounts. The account promises no monthly fees if you maintain a balance of $1,000, otherwise the monthly fee is $3.90. It also includes 10 free monthly transactions. TD Canada Trust Everyday Chequing. If you want to avoid a monthly fee of $10.95, you have to maintain a $3,000 minimum balance. They do load you up with 25 free monthly transactions. With an initial deposit off $100, you get a $25 bonus. If you switch your direct payroll deposits over, Tangerine rewards you with an additional $1,000 bonus after three months. They offer no fees for daily chequing transactions. There’s no limit to the amount of transactions you can make, but there is a $10.95 monthly fee to go with it. You can eliminate that fee, but it requires a qualifying investment, a credit card, mortgage or “Homeline” plan. There are five different types within this umbrella. The minimum package includes a $4 monthly fee that can be waived with a minimum balance of $2,000. You also get 12 transactions a month and unlimited Interac transfer transactions. The monthly fee of $12.95 is waived if you maintain a $3,000 balance. It does offer unlimited debit transactions. The $4 monthly fee is waived for youth, students and Roistered Disability Plan beneficiaries. The low monthly rate comes back to haunt you with several fees, like $1.50 for in-branch bill payments, $1 for in-branch withdrawal, 75 cents for cheque clearing — just to name a few. They do give you 14 free transactions a month. There are no monthly fees if you make a monthly direct deposit or two monthly direct debits. Otherwise the fee is $9.95 a month. The account comes with an automatic $25 overdraft that can be increased to $500. This account also rewards you with 25 cents per transaction up to $5 a month. If you would like to explore other accounts and compare, check out this comparison table provided by the Rate Supermarket. Something to consider when exploring options is how many transactions you do in a month. It might help you determine the best solution since many freebies are limited. How often do you deposit money in a month? How many times to you hit the ATM? Are you using cheques anymore? The ability to bank online has simplified the process for many people and banks are certainly taking this into account (pardon the pun). 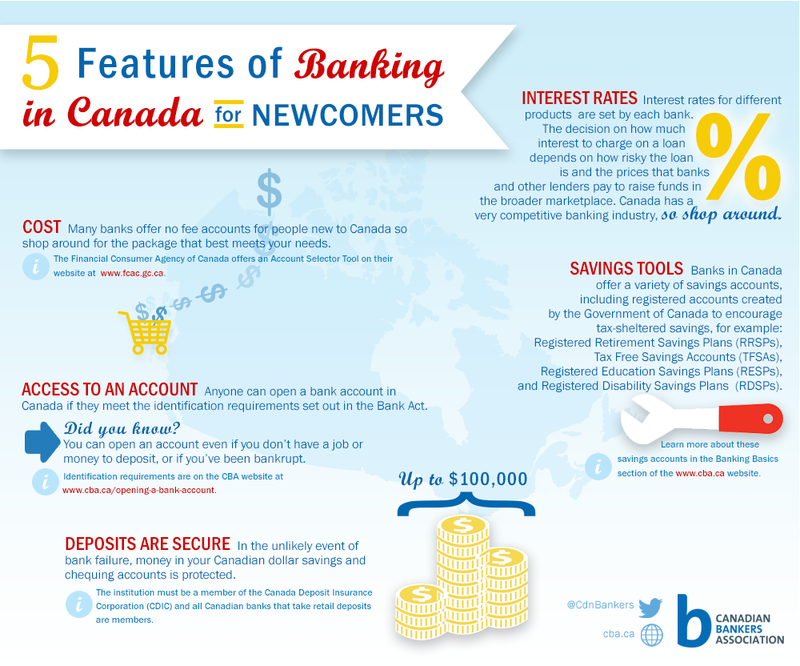 If you are a newcomer to Canada, here’s an infographic that highlights some of the key things you should consider. At the end of the day, shopping around is the answer. Compare the basic things: number of free transactions, minimum balance requirements to get fees waived, interact and e-transfer fees, debit or deposit fees —- for the banks, it’s a fees – tival. So make sure you dig down on the details.